On the southwest corner of Central Park West and 106th Street in New York City, there’s an enormous castle. It takes up the whole east end of the block, with its red brick cylindrical turrets topped with gleaming silver cones. The stained glass windows and intricate stonework make the building look like something out of a fairytale. This building’s past, however, is not very fairytale-like at all. When it was built in 1887, this castle was the country’s first hospital devoted solely to the treatment of cancer. 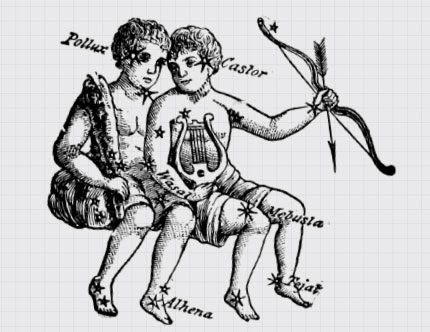 In the late 1800s, cancer was known to start as a tumor, but doctors didn’t know a whole lot beyond that. In the back of the castle, was crematorium and a smokestack which was smoking pretty often. In the late 1800s, a lot of hospitals in the United States didn’t want to treat cancer patients because they thought cancer was contagious. Hospitals also had to publish their “death rates,” so they’d turn away patients who were likely to skew the numbers. This gave rise to tuberculosis hospitals and other specialty hospitals for diseases that were particularly deadly. During and after the Civil War, American cancer patients would go to Europe, if they could afford it, since European doctors had developed more advanced forms of cancer treatment. 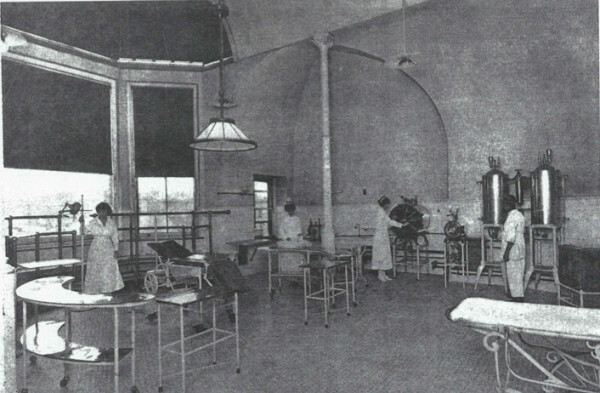 Doctors from the United States would also go to Europe to study pathology and surgical techniques, and one such doctor, J. Marion Sims, wanted to bring some of these European cancer removal methods back to the United States. 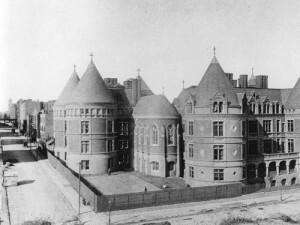 Sims had previously worked at the New York Women’s Hospital, but in 1874 that hospital decided not to admit patients with cancer, because, for all they knew, cancer was fatally contagious. 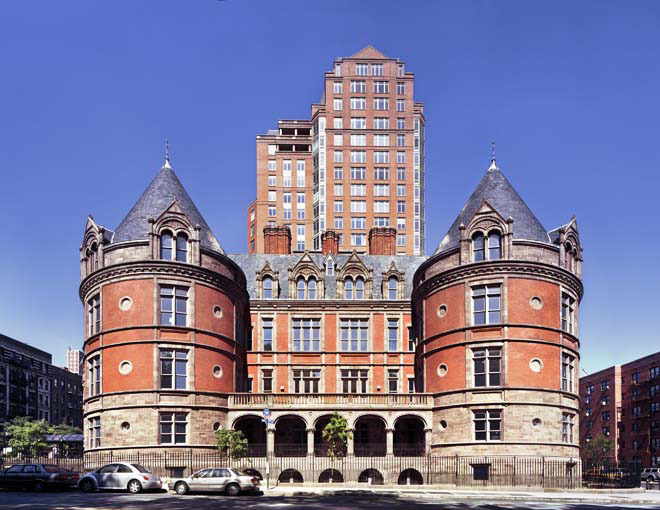 In 1887 Sims and a number of philanthropists established the first hospital exclusively devoted to cancer care: the castle at 455 Central Park West. The building’s fairytale appearance, it turns out, wasn’t unusual for hospitals of the time. 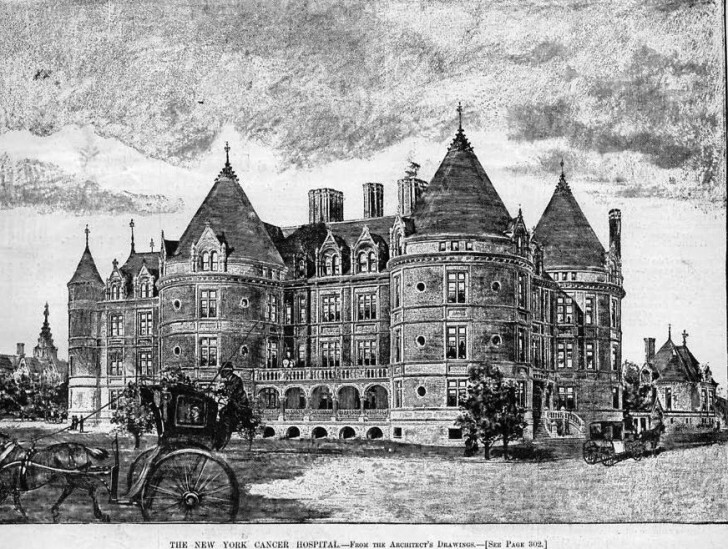 These facilities were built like aristocratic mansions, with high walls, gatehouses, elaborate entries, and sometimes turrets, as a way of enticing wealthy patients. 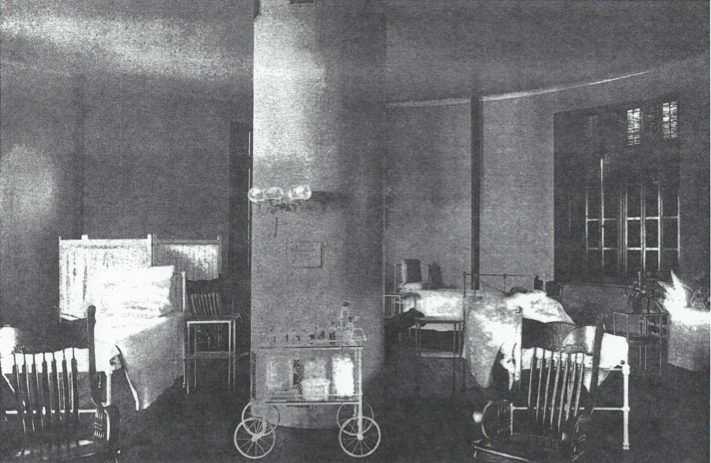 In the late 1800s, hospitals were charitable institutions run by philanthropists, where poor people went for care. The wealthy mostly received care at home. Architect Charles Haight hoped the luxurious design of the New York Cancer Hospital would be a lure for paying customers. 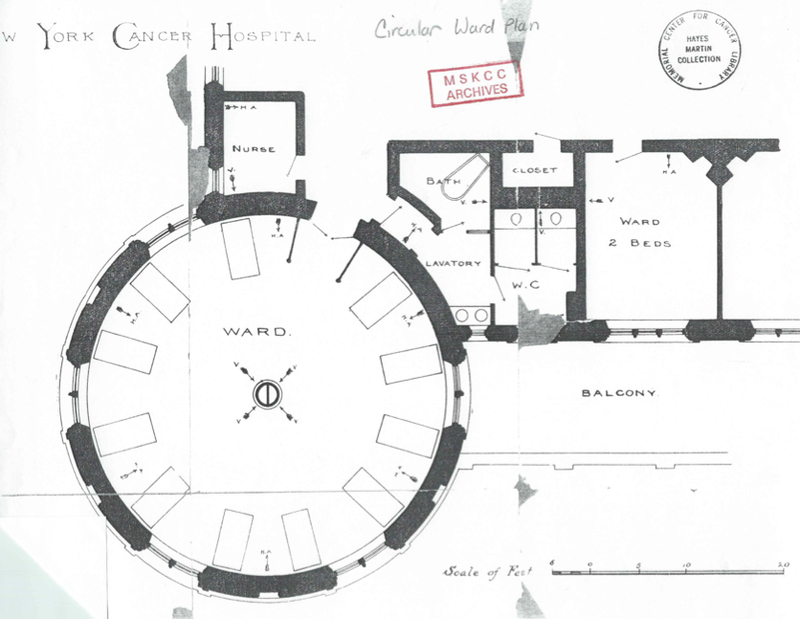 The big, round turrets that make the building look like a castle were actually wards that housed patients. The perfectly circular rooms were about 40 feet in diameter, and from an aerial view, the rooms looked like the face of clock, with beds around the perimeter. Doctors could easily make the rounds from bed to bed, and these circular rooms kept dirt from accumulating in corners. Patients got plenty of fresh air, sunlight, and delicious food. There were even champagne parties and carriage rides in Central Park to further entice paying customers. The building tried to make patients feel like they were going off the French country side, instead of a scary place where they would be subject to experimental cancer treatments and, quite possibly, die. Medically, nobody really had any idea what they were doing. The main treatment for cancer at the time was surgery—namely, cutting people open and removing every lymph node possible while still keeping the patient alive. 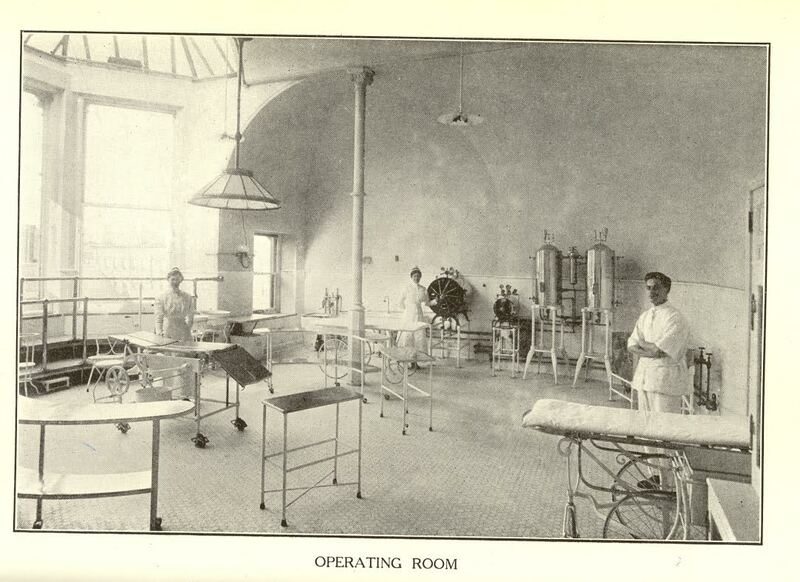 This was also before the time of antibiotics, so a lot of patients died from infections after surgery. As late as 1920, only around 15% of patients survived a cancer diagnosis for more than 2 years. In 1900, the numbers were even lower, (hence the on-site crematorium). Under that billowing smokestack, the New York Cancer Hospital soon earned a nickname: The Bastille. In trying to look like French chateau, the New York Cancer Hospital ended up feeling like a French prison. Despite a huge demand for cancer treatment, the hospital struggled financially and couldn’t attract patients. Courtesy of RKTB Architects, P.C. In an attempt to get people in the door, the New York Cancer Hospital procured a controversial new form of medicine: radium. 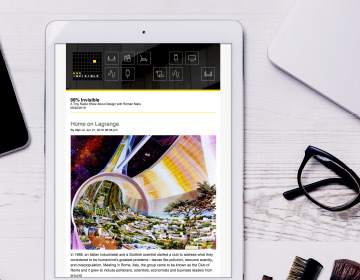 Radiation therapy, even more so than surgery, was completely unexplored, and a lot of doctors and care workers developed cancer themselves from handing the element. 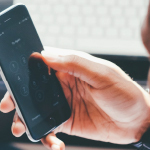 It wasn’t until the 1930s or that surgery improved and chemotherapy and other organized radiation treatments made cancer care very lucrative. 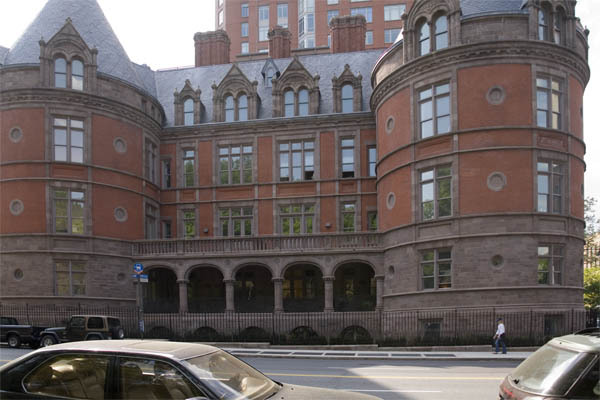 In 1939, the cancer hospital left 455 Central Park West for the Upper East Side, where it became Memorial Sloan Kettering, which is now known as one of the best hospitals for cancer treatment in the U.S.
Now, of course, hospitals don’t look like castles anymore. After World War I, hospitals start to look like small civic institutions like city halls, or schools, with square block-like units. Paying patients could expect single rooms, and non-paying patients could be put in a double or quadruple room. Instead of investing in gourmet food, champagne, and carriage rides, hospitals channeled money into surgical suites and mechanical equipment. Wooden beds and dressers disappeared and instead all furnishings were metal and carried an air of efficiency. After World War II, office building became the models for skyscraper-like hospitals. After the 1980s, hospitals start to look like shopping malls, with just one or two floors of big open spaces. 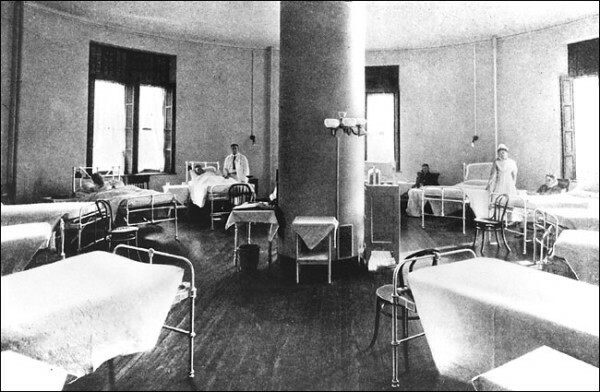 Hospitals have done away with circular rooms, but the general idea of easy-to-clean rounded corners has actually persisted. If you go visit a hospital today, look at where the wall meets the floor. It’s probably curved, so that nothing can get stuck in the right angle between the wall and the floor. 455 Central Park West went through a really dark period in the mid-1950s, when it became a notoriously roach infested, abusive nursing home. Towers Nursing Home was shut down in the 1970s and the building sat vacant and in state of disrepair throughout the 1980s. 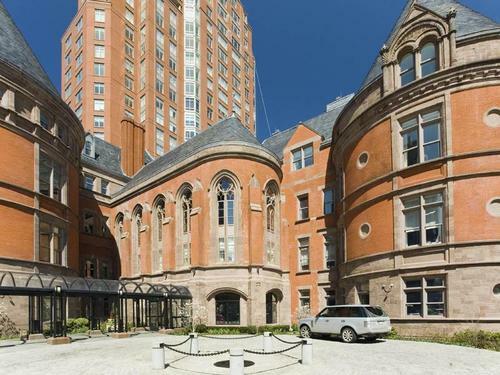 Today, in 21st century Manhattan, even a haunted old hospital can become expensive housing. 455 Central Park West has been turned into seventeen round, light-filled condo units, complete with a parking garage, a spa, a pool, and a fitness center. 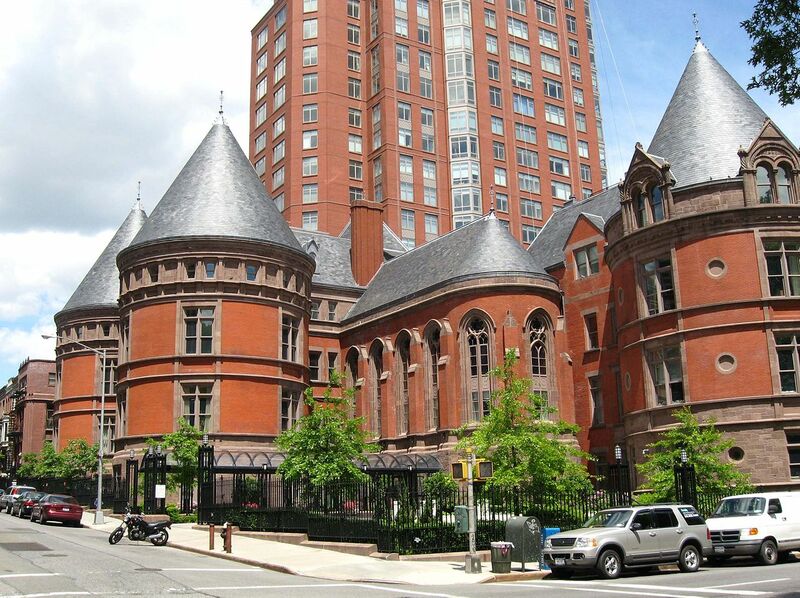 Finally, after a hundred years of imitating upscale real estate, the castle on the park finally is actually what its always wanted to be: a nice place for rich people. Photo by John Bartelstone, courtesy of RKTB Architects, P.C. 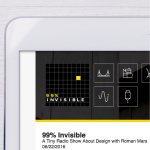 Producer Jessica Miller and 99% Invisible’s Katie Mingle spoke with writer Jim Rasenberger; Elaine Schattner, clinical associate professor of medicine at Weill Cornell Medical College; and AnnMarie Adams, director of the Architecture School at McGill University. A great mystery solved along with an informative history lesson. Wonderful listening. Kudos Jess! Heart ache and pain who would want to live in such a place. Is this the same building that Jeff Bridges breaks into to steal the “Holy Grail” in The Fisher King? The exterior looks the same, but that film is from the early nineties. 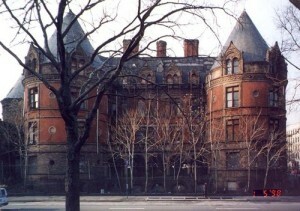 This building was used as a location for Michael Almereyda’s vampire movie, “Nadja.” We used the chapel (the lozenge shaped wing with Gothic windows) as “Dracula’s Castle, Transylvania – Bedroom.” It can be seen toward the end of the movie; the scene where **spoiler alert** Nadja is transfusing her blood with Cassandra’s. The place was a stunning ruin when we were there as it had been abandoned for some time. It was probably totally unsafe, but so much fun to photograph. I am so happy you mentioned The Knick! I love that show! Its actually on the NORTHwest corner, not Southwest. I winder is this building is in fact the origin of the term “Making the rounds”? You might be interested in the Hospice de Beaune in France , as an example of a very old hospital, which might have inspired these kind of hospitals as well. It just recently ( in the 1970s ) moved to a new location after more than 500 years. Fresh air and good nutrition are nursing practice. These innovations caused Florence Nightingale to drop the death rate by 98% during the Crimean War. Call it NURSING, okay? If physicians did it, you’d call it medicine.